Platform PC, PlayStation 4 and Xbox One. It’s been eleven years since Micro Machines V4 launched for the PlayStation 2. A lot has changed in this time: online multiplayer has almost replaced local multiplayer entirely, extra content through paid DLC is now the norm, pre-order bonuses for extra advantages in-game online and of course, loot boxes that give you things you don’t want in exchange for real money. Micro Machines: World Series reminds us that not all games can be seamlessly translated into the modern age, much to fans’ disappointment. Another area where Micro Machines: World Series is noticeably slower is during the interlude periods of Elimination mode. Elimination mode is a staple of Micro Machines in which players race each other on the same screen until one remains. In previous Micro Machines games, players only had to wait five seconds between rounds. World Series doubles this number to ten seconds for both the local and online versions of Elimination. This ruins the ‘just one more game’ effect as the interludes take up one-third of the time spent playing the game. For a £20/$25 game, you’d expect more content that what World Series is offering. Players will be surprised to find that there is no campaign mode of any sort, let alone any type of single player content aside from playing one off games against the AI. I don’t want to have to keep comparing Micro Machines: World Series to the previous entries in the series, but if Micro Machines V3 (a PlayStation 1 game) can include a campaign mode then surely this one can too? Perhaps the reason World Series lacks any sort of continuous single player content is due to the lack of available racetracks. Featuring only ten tracks in Race and Elimination mode, I imagine there wouldn’t be much to make a single player game out of. On the flipside, those that want to play with seven friends will miss the local eight player support. This omission isn’t too surprising considering the online focus, but it would’ve been nice to keep that legacy going. With the focus shifting towards online play, the most notable addition to World Series would have to be the Battle Modes. Up to twelve players are now able to participate in Capture the Flag, Bomb Delivery and King of the Hill… however, it is very unlikely you will ever get to play alongside twelve real humans. I’ve been playing World Series almost every day since the game launched on both PlayStation 4 and Steam, so far I’ve yet to see more than six humans in any game thus far. I don’t believe the inclusion of real players will have made any of the Battle Modes better but at least it would’ve made the queue times shorter. You can expect to wait on average more than one hundred seconds before entering into any game, and most of the time you’ll be playing with the likes of Spider, Chen and Jethro (the lads). Again, you’d better get used to playing against the AI because you’ll be making yourself familiar with them in every single game. The reason why the Battle Modes are so disappointing is because it’s so hectic. Codemasters have crammed twelve cars, each with their own unique stats and abilities into a single arena. It’s difficult for people who have been playing the game for hours to keep up with the action, let alone brand new players entering the arena for the first time. In addition to this, with the AI focusing on attacking other players rather than aiding with the objective, each game feels drawn out and boring. The lesser of the three evils has to be Capture the Flag as it is the least complicated Battle Mode and can be finished relatively quickly. Unfortunately, you cannot select your preferred Battle Mode as it chosen for you at random. It appears that Codemasters have shifted their priority from playing with your friends locally to strictly online play. Even when grouped up in a party filled with your friends, you do not have the option to play privately. You must play in the AI filled Race, Elimination or Battle modes. In a way, you do get to play privately as it is unlikely anyone else is going to be online to take up one of those remaining slots. I’ve been talking a lot about what Codemasters haven’t included from the previous games in the series, here’s one thing that they have kept: weapons. Now you may remember the weapons from V3 and V4 which, while annoying at times, brought something new to the series. World Series takes the weapons (the bomb, gun and hammer) to another level by upgrading them from minor annoyances to major game-changers. All three of the available weapons in World Series have the ability to destroy vehicles, two of which can eliminate another player in a single shot. The gun can be classified as the most balanced weapon in Micro Machines: World Series, in so much that it requires more than one shot to take out an enemy. Its bullets will slow down and stun opponents, eventually eliminating them if enough shots are landed. If you are lucky enough to get the hammer, you will have three chances to kill the player in front of you. Lastly, the bomb can be dropped behind you to either outright explode vehicles or push them away. Each of the three weapons are distributed randomly, meaning you are as likely to get a hammer in first place as you are a gun. This creates huge divides in the race as the player in the first place can protect their position for the duration of the game. Likewise, a player in twelfth place has very little chance of clawing their way up the ranks. 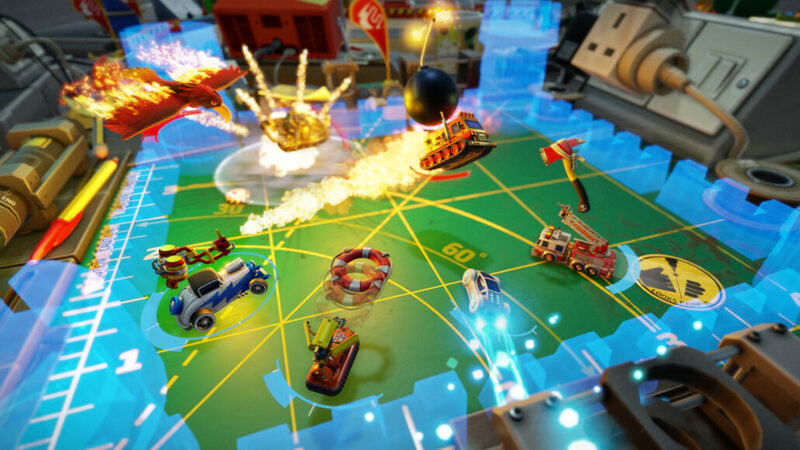 As you can see from most of the footage released prior to the game’s launch, you may have noticed Micro Machines: World Series running at a perfect 60FPS. I finally got to try out the PlayStation 4 version of the game, something that was missing from the preview event back in May. I was surprised to see the PlayStation 4 version (even when running on a PlayStation 4 Pro with Boost Mode activated) runs at an inconsistent 30FPS. To top this off, the player base appears to be as bad on the PlayStation 4 as it is on Steam, so if you have to pick up a copy of the game make sure you get it on PC. Reviewed on PC and PS4 (codes provided by the publisher). You can buy it on Amazon. 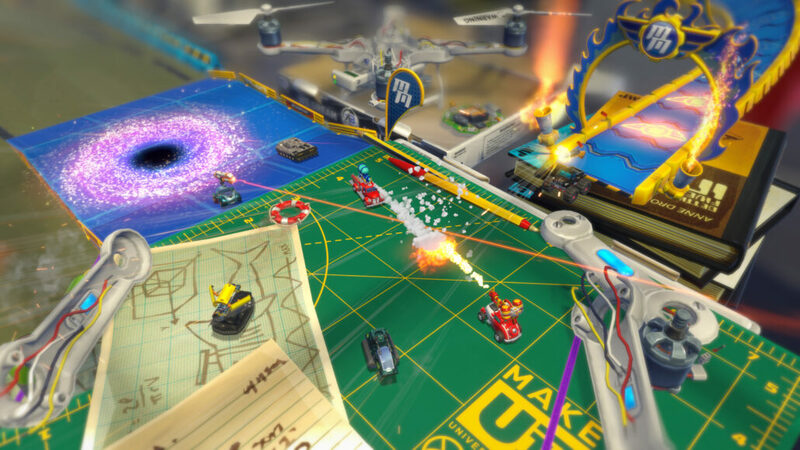 Codemasters had good intentions with the latest instalment of Micro Machines, but their decision to concentrate on the Battle Modes instead of refining the racing aspect of the game will ultimately cost them in the long run. As a result, World Series has ended up being a ‘jack of all trades’ game. Rather than perfecting one aspect it attempts to cover everything, ruining the game in the process. If you are craving the true Micro Machines experience, try booting up one of the older games instead. Licensing - the Hasbro branding is cool and ties in well with the Micro Machines theme.